Tree House is an incredible family vacation rental within minutes of the sea, marina, dining, and activities. It feels tranquil and modern, thanks to two stories of spacious common areas with ocean views. It’s super kid-friendly, too. There’s a playroom, a playground, and a huge lawn for tiny travelers to explore. A private path leads to the beach, and Turtle Cove Marina is a short drive away. Family friendly villa offering privacy and views of the ocean! Tree House is a family estate with a private path to Grace Bay Beach. Fabulous privacy, ocean views, and modern design make this two-story home ideal for any luxury vacation. 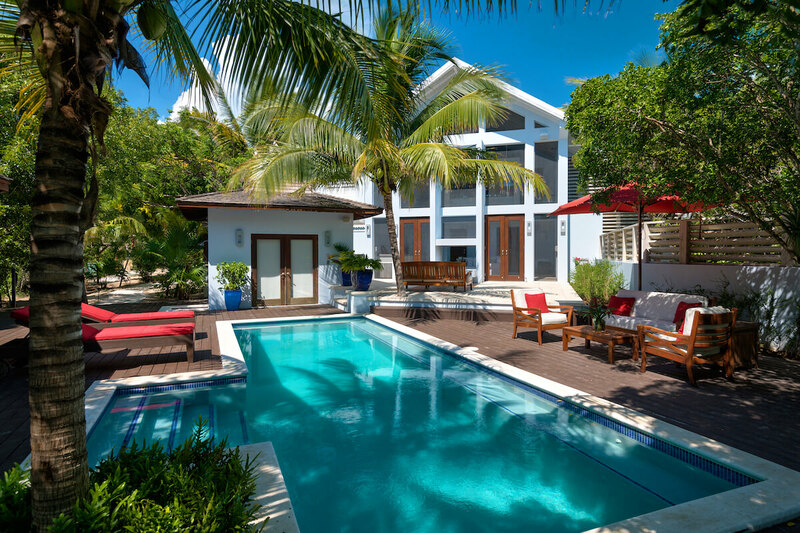 The villa is located 450 feet from Grace Bay, so guests can enjoy tranquility and convenience. Tree House’s private pool is surrounded by comfortable loungers, sofas, beautiful landscaping, and ambient lighting. The dining gazebo offers a gas or coal barbecue grill, a sleek countertop and sink, and a cool atmosphere thanks to the overhead ceiling fan. There’s also screened dining for 12-14 guests on the upper level balcony. Kids will love the large cedar playground and lawn, and adults will love the free weight gym. There are lots of towels, beach toys, and snorkeling gear for guests’ use. Tree House is also home to a quarter acre vegetable garden with bananas, herbs, spices, and produce. On the main floor, there is a cozy living room with an entertainment system, bright decor, and a ceiling fan. The upper level’s open floor plan includes beautiful ocean views, an inviting living room, and a crisp white kitchen. The media room features a projector screen, central stereo, and direct television via satellite. Kids can play inside the padded play area, which offers tons of toys for all ages. In total, The Tree House has six bedrooms and five-and-a-half bathrooms. On the upper level, there is the master suite, a double suite, a queen suite, and a children’s room with a bunk bed. The master suite has a king bed, ocean views, and a deep bathtub. On the lower level, there is one king and one queen suite. Tree House guests can snorkel at Smiths Reef, visit the marina at Turtle Cove, or play in the sand along Grace Bay. There are also several restaurants and activities within a short drive. Rates do not include: tax of 12%, island charges of $200.